Partial finished truss mirror cell for 16" mirror Sold! PENDING TO VAN: I have decided to abandon my 16" truss project due to time constraints. Truss style mirror cell frame based on the Kriege/Berry book. Made out of steel and welded together. Mounting holes are already drilled. Threaded collimation bolt holes drilled and tapped. Holes for the mirror sling split-bolts already drilled. Has quick coat of stove black paint, but recommend to paint again with flat black prior to installation. Some of the paint flaked off of the side rails probably due to factory oil residue on the steel. The triangles are made of aluminum nearly 1/4 thick, and are mounted to steel bar. The triangle assemblies are precisely measured and cut so that when mounted to the precisely drilled collimation holes, the support points are at the optimal location for an 18 point cell (and 16" diameter 1.5" thick mirror) according to PLOP. In short, this cell was measured and designed with support point optimization in mind. I really don't know what to ask for this since it is unfinished, but I just want to break even on the metal and time spent cutting and drilling. As a side note, as you can tell the triangle assemblies are just lying there for the photo, they are not attached in their proper place. 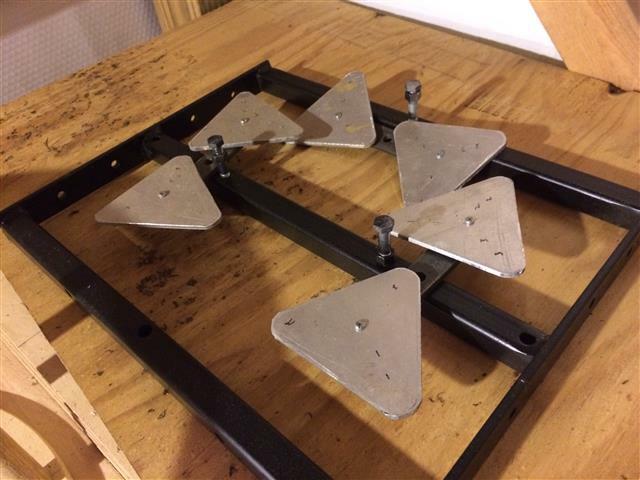 How about $65.00 for the cell frame and triangle assemblies? UPDATE: I have had several inquires about this. The first one to commit gets it. Price includes shipping but to CONUS only! Please do not ask me to ship out of the USA. Sorry.